Be your own tour director and explore Acapulco to discover the intersection between Mexican tradition and modern day convenience. A car with a professional tour guide/driver will be at your disposal for four hours to show you the most important sites in the port. Admission to visited sites is not included. Acapulco is generally split into three main districts, the Traditional Zone (the Old Acapulco district), the Golden Zone (the Dorado district) and the Diamond Zone (the Diamante district), and further divided into a series of smaller neighborhoods. You will have a driver and car at your disposal for four hours to discover these great places. Once named 'Acapulco Tradicional' and now often referred to as 'Acapulco Naútico', the Old Acapulco district is a particularly historic part of the city and filled with character. 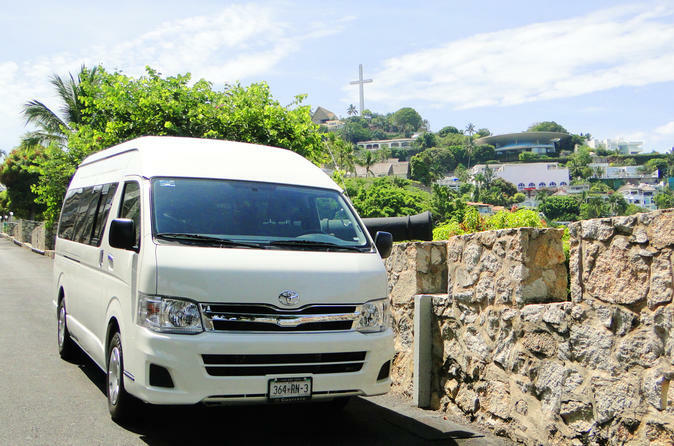 Located on the western side of the city, many of the main attractions lie within Acapulco's Traditional Zone, such as the Isla La Roqueta and its small zoo, the white Byzantine-style cathedral, the La Quebrada cliff divers' shows, and the beaches of Caleta, Caletilla, Hornitos, Hornos, La Angosta, Manzanillo, Tamarindos and Tlacopanocha. The Dorado district is better known by tourists visiting Acapulco and the Golden Zone and is one of the city's biggest and most significant districts. This part of the resort is based around the Avenida Miguel Alemán (La Costera) and located next to Acapulco Bay (Bahia de Acapulco), directly east of the Playa Hornos. Many upmarket restaurants and shops can be found here, along with endless mid-range hotels and regular events at the Centro Internacional de Convenciones Acapulco (International Convention Centre). Both the Playa Condesa and the Playa Icacos reside in the Golden Zone.